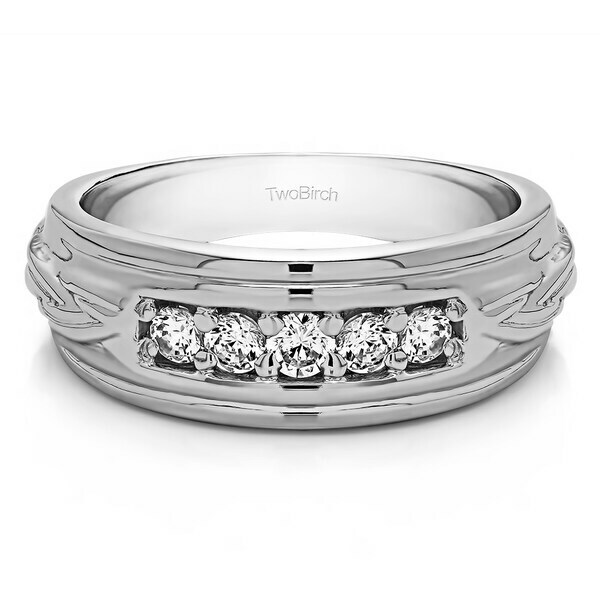 This mens ring is the perfect mix between contemporary design and classic style. The channel set round stones in the center give it the classic, while the unique engraving on the outside of the ring make it a cool mens ring. Versatile enough to be worn as either a mens wedding ring or a cool mens fashion ring. At TwoBirch, our rings are built to last a life time. Gorgeous White Sapphire is set into solid Sterling Silver. The craftsmanship and quality material ensure rings built to last a lifetime. Its perfect for us. We love the properties and health benefits of the white sapphire.